It was a good matchup here. I got first player and selected targeting beacons. I place two in one corner, away from the battlefield, while he placed his two central to the battlefield. The early game was in my favour, as the VCX moved up I was sure I was gonna have the beacons following my ISD all game. Turns out, he had not read the latest FAQ fully. He went wide with the Hammerheads, the MC80 and Pelta heading central with the fighters. He was hoping to command the fighters through the VCX, but was way out of range thanks to the relay nerf. 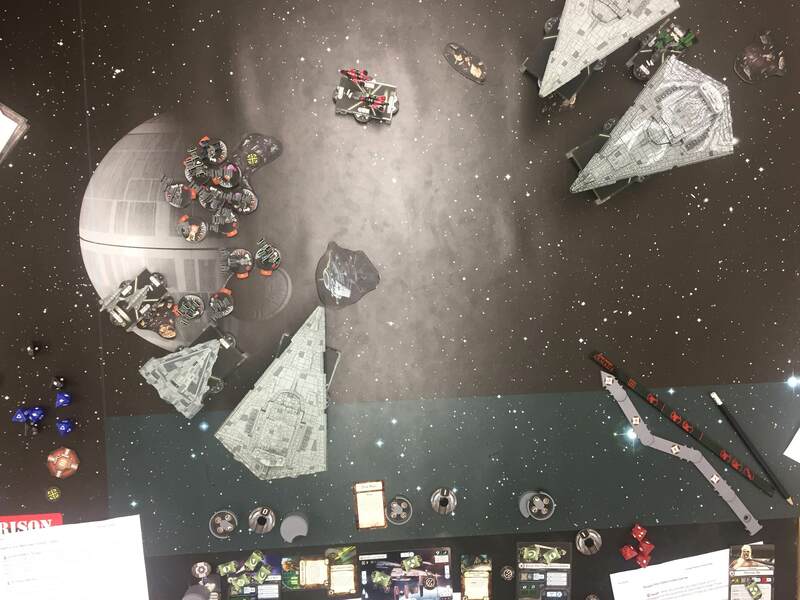 I was poised to strike at the top of round 1, and went full throttle in with Dengar and four bombers (commanded by the Quasar) at the start of turn 2. The MC80 was in for a slow death from then. I held the ISD as long as I could, sending in more and more bombers. Ultimately, the squadrons spent a long time shooting bombers (while getting slowly killed by the Dengar granted Counter 1). The Hammerheads arrived to the fight, just as the MC80 went down, too late to help, with my ships minimally damaged. They also trickled in one by one, allowing me to refresh defences and take them piecemeal. They were easily picked off one by one then, even chasing down one with bombers as it tried to escape. The ships approach the ball of death. Result: 9-2, all enemy ships "destroyed", in exchange for my flotilla and my Quasar. He scored most of the tokens however, so pulled a 9-2. Lesson: I had to engineer every turn from 3 to keep my Cymoon alive, knowing if it died no number of Bombers would save me. Between that and sitting on the station, I managed to endure long enough for the bombers to do their job. Without Thrawn commanding my squadrons, I don't know if I would have won. This list is VERY vulnrable to getting it's two ships ganked, and then losing. You NEED to keep them alive. Nick had Riekeen, the rebel favourite. His flagship was an MC75 Ordnance, with a helping hand from Salvation, a CR90B with HIE and Jaina's Light, and a flotilla. Squadrons were reasonably strong. Corran Horn, YT-2400, E-wing, 2 generic A wings. Enough to potentially lock me down. I was unsure going into this game. I had figured out another weakness in my list, once more just before my opponent did: Dengar. Kill the bounty hunter, and the rest of the bombers can be pinned down by minimal squadron presence. This was a quick game. We flipped for first, and Nick won it. I chose Contested Outpost, and once more sat the station as close as I could to me. The battle was met quickly, as the MC75 was been bombed at the top of turn 2, and dead at the end of turn 3. The trouble this game was, the whole time I was close to losing my bombers with E-qings and Corran sniping Dengar. Fortunately, the dice gods forgave my poor list, and gave few accuracies, allowing Dengar to scatter, and more than once having four blues come up with just accuracy and critical. Dengar survived two turns on 1 hull, been shot by two E-wings and the YT-2400 thanks to this, which was long enough for me to jump my Bombers away from the fight (which had built nearby the MC75's shipwreck) and onto other targets. He focussed on downing the Quasar with his one close range MC75 hit, but bad dice saw it survive. When Dengar eventually died, bombers were picked off one by one, but it was fine. The job was done. I set constant engineering dials on my ISD after turn 3, which was a mistake. Once the Thrawn squadron commands dried up, I couldn't use the bombers to chase down the fleeing CR90b, which meant the game ended with it still alive. Thanks to gaining contested outpost every turn bar one, I still had a huge lead. Result: 8-3, enemy CR90b, Corran Horn and YT-2400 survived, my flotilla, Quasar, Rhymer, Dengar, Tempest, multiple bombers dead. Lesson: Here a minimal squadron force was flown highly effectively, and showed me a stronger force would shut down the bombers. Don't use the Cymoon. When you only have two ships in your fleet, enemy ships WILL beeline towards you maximum speed. I'd recommend the ISD-1 for this job. The higher squadrons and black dice, and cheaper price, make it perfect for this job. I was at knife fight range with multiple enemy ships with my ISD, every game, for 3 or more rounds. This CANNOT be avoided, especially against a canny opponent. Cut the head off the fleet, with the ISD, and you stop the Thrawn commands, you stop the shooting damage, you're way more than halfway to victory as the Quasar is a pushover, even for smaller ships. 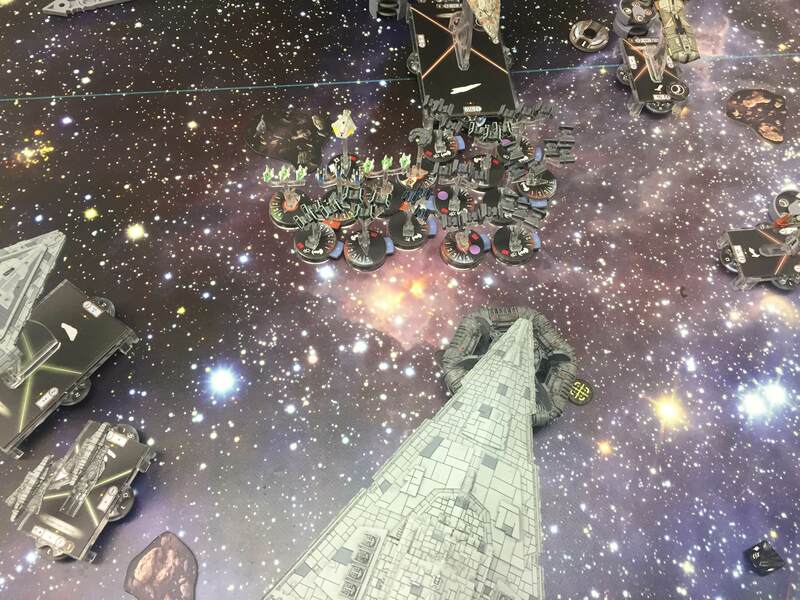 The higher squadrons are good too, as you should be commanding your bombers even into the late game (more on that later), and with a dead Quasar the ISD will have to fill in. With this in mind, don't be afraid to repair your ISD supercarrier. If it goes down, I guarantee this fleet is basically spent. Destroying an ISD is not too hard a task for an experienced player, so be prepared to keep it alive. Thrawn will push squadrons, the ship will keep itself alive. Don't count on enemy ships landing on you, to stay stuck with them bombing them. As someone who loved the B-wings, I did this every game with them. You CAN'T with this list. You have literally TOO MANY squadrons to be able to get them all in one arc, in base contact, when they land on you. Rhymer is great in this list. I was hesitant to take him, but you NEED him for the same reason mentioned above. If you pack all your bombs into one arc (and you should, trust me), you WILL run out of space for ships in all but the largest arcs of the largest ships (ISD fronts), which you may not always want to go to anyway. You need the extra bombing range granted by Rhymer to allow all 11 bombers to get their black dice in. Keep your BCC closeby. Single black dice are fickle. DON'T reroll single blacks. Every damage is worthwhile. Every time my opponent spent defences to protect them from the Bombers, they made themselves more vulnerable to the ISD. In fact, you're almost a mini Sloane here, and honestly, I think perhaps better. Take more Intel. Dengar is too vulnerable. I need another Jumpmaster to make this list less vulnerable, and taking Dengar out (something two X-wings can do with good rolling in ONE TURN) can basically take out all your bombers. Prioritise, and focus fire. Keep the pressure on one ship at a time, more than usual. First player is very nice with this fleet, but not entirely necessary. Keep some sort of bid. If you can, take it slow and play defensive. Waiting for them, unless you literally cannot because of objectives or similiar. So, knowing all that, what's my new version of this list? All I'll say about composition is that you could still fit Squall into that final list. I used Squall once during the whole tournament, and quite honestly it didn't do much. Not once did I find I needed an extra push to get my TIE bombers where they needed to go, not once did I have Bombers (after the battle really started) out of place because their too slow. It might be because I'm used to using B-wings, but honestly, I rather have 3 points towards first player then Squall, and not sure what else I'd drop. I was reading the front page and thinking of starting a thread with a Dr Strangelove reference - then I saw this - eerie. Embrace the bomb. Embrace Cirt + Hit black dice. Embrace! 1. Replacing 2 bombers with 1 Firespray may be beneficial to ease the pressure on squadron activations. 2. As strange as it may seem, but I still prefer this type of list with Motti as he increases Quasar survivability significantly. 3. Opening Salvo seems like a bad objective for you as it can easily rob you 80+ for 1 hull damage on your ISD. 4. Spending points on Assault Carrier feels like a waste of points to me, but I may be missing something. 5. If you would go with some Firesprays mixed in I would think about utilizing Kuat refit for the defensive slot. 1. The idea of this list was to make TIE bombers work. It's a fun sight to pile them onto people. 2. I understand Motti, however Thrawn proved instrumental in more then half the games. 3. This was a misclick on my list! Should be precision strikes. 4. Same again! I did this for my tournament list, which costed me a few victory points everytime it died. I'll fix it up. Could use the points on something else. 5. Maybe. I hated the Cymoon in the original list however partly for its bad squadrons. It's interesting to see you have got Thrawn working for you - I've yet to really get my points worth and would have gone with Admiral Sloane, so it's interesting to see Thrawn in the hands of a more skilled player. Always interesting to see how people use their builds - thanks for sharing! Thrawn is amazing. I myself am still somewhat simplistic in my use of him, but even then, I can see his worth. People often say that they do not know how to use Thrawn, because if they want to give him navigate, they might as well take JJ or Ozzel, repair, Motti, etc. For me, his ability is far better than the admiral who is specialized at one thing. The above report is a perfect example of that. My experience is similar. With Thrawn, I am free of worrying as much about commands. It makes ISDs even more deadly, for example, by allowing them to navigate almost every turn while still guaranteeing 3 rounds of repair. People are often caught off guard by how maneuverable an ISD can be when it has navigated several turns in a row. Or carriers. The Quasar is a fragile ship. Threatening it means that the owner has to decide - command squads, or repair? With Thrawn that problem goes away. I am still at the stage where my 3 dials are repair (heck, my Thrawnless dials are normally nav then 5 repairs). But even then the flexibility provided is astonishing. Being able to do two commands at once is far more valuable than having a specialization in one. Food for thought! I'm about to start a Corellian campaign and have been dithering between Thrawn and Sloane on one of the fleet builds for precisely the reasons you state above. The ability to be able to repair and/or navigate, and still be able to give out the fighter activation commands is very tempting vs the ability to use the target icon dice to nullify defence tokens. My fleet is bomber heavy, but has a carrier which is as you is fragile. Although I could put Thrawn on a brawler fleet and the ability to retain navigation flexibility AND still do repairs is hugely tempting. Sloane wouldn't work for this list as she's useless with TIE bombers. Impossible to roll an accuracy to spend defences, and I don't want to reroll crits. I also wouldn't recommend Sloane for CC, but that's just my opinion. Came for the title, stayed for the joy of TIE Bombers as well as Thrawn going to town! I do suspect that your might struggle against a well-flown squadron list or if a decent Raddus list. Interestingly, one of my favorite tools to clip the wings of post-FAQ squadron builds has been to neuter their carriers with slicers, something that would be absolutely futile against Thrawn-fueled fighter wings. Yes, it is nice that Thrawn provides you immunity to the usual slicer counter. And yes, this list is very fragile to be taken out by a well place Raddus, or a Riekeen aces, or a few others. I was fortunate not to hit any of those lists. Since someone brought this post out of the archives, I wanted to say thanks to the OP for your insights. I’m considering using a modified version of a campaign list around once. It was easier to do with 500 points than 400. Any comments appreciated. The Jonas/warlord combo may be overpriced but should be another headache for the opponent to deal with. This is a fleet i can imagine with 7th fleet. Though still need a BCC IMO. Maybe when and if the fighter squadrons pack I's come back in stock I'll be able to do this. For right now my limit is two bomber sqaudrons. Then I just need to find some armada players to play this.